alaTest has collected and analyzed 26 reviews of Lenovo ThinkPad T470s. The average rating for this product is 4.0/5, compared to an average rating of 4.1/5 for other products in the same category for all reviews. People really like the screen and keyboard. The battery and portability also get good comments, whereas many are critical about the image quality and energy efficiency. We analyzed user and expert ratings, product age and more factors. Compared to other products in the same category the Lenovo ThinkPad T470s is awarded an overall alaScore™ of 90/100 = Excellent quality. The Lenovo ThinkPad T470s isn't revolutionary, but is a reliable and travel-friendly business laptop loaded with modern features and ports, making it a worthy upgrade to its predecessor. Light and portable design. Touch screen. Myriad port and connectivity options. Comfortable keyboard. Long battery life. Feature set and performance don't stand out among similarly priced competitors. Lacks removable battery. 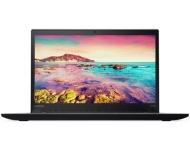 The Lenovo ThinkPad T470s is a thin computer with strong performance and a wonderful keyboard, but competitors offer lower weight or longer battery life. This premium 14-inch business notebook offers a good mix of business-friendly features and battery life, but is it outdone by Lenovo's own ThinkPad X1 Carbon (5th generation/2017)? Lenovo ThinkPad T470s – What is the best display option? Agony of choice. We compare the displays for the new ThinkPad T470s. WQHD, Full HD or touchscreen – how does the choice influence the picture quality as well as the battery runtime? Business users require a special sort of laptop and the ThinkPad line has been serving it up for years. The ThinkPad T470S follows in those footsteps. A great Ultrabook for business or personal use. Great improvement to the trackpad, decent improvement to the keyboard, great battery life and nice screen. You can’t go wrong with this one if this is in your price range. The refreshed ThinkPad T470s brings a faster CPU and other enhancements to one of our favorite thin-and-light laptops. It isn't cheap, but near-perfection rarely is. Hardware well specified for the price.